What do ants dream of? Which animals actually sleep? Many people seem to think sleep is restricted to vertebrates such as lizards, birds and primates. But actually, insects sleep as well! Ants, being insects, are very interesting for studying sleeping behaviour, as they live underground. Most ants get exposed to sunlight only very irregularly, so a sleeping rythm based on a photo period such as we do (e.g. sleeping while it’s dark, being awake while it’s light), would not be very useful. Because of their social and subterranean lifestyle, one might expect that sleep periods of ants are more dependent on the tasks at hand than on light/dark periods. This is indeed what Deby Cassill and collaborators found. 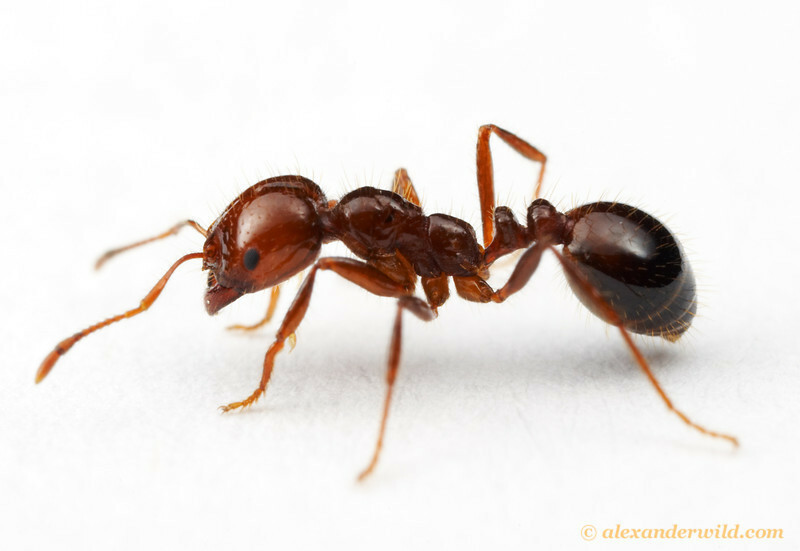 Queens of the fire ant (Solenopsis invicta) have an average of 92 sleep periods per day, lasting for about 6 minutes each (for a total of 9.4h of sleep per day). Workers are very different from this, as they had 253 sleep episodes on average per day, each lasting about 1 minute, for a total of 4.8h sleep per day, meaning they sleep more often, but less long. Furthermore, at any time of the day, about 80% of the working force was actually working instead of sleeping…an efficient workforce indeed! A Fire ant (Solenopsis invicta) worker. Picture by Alex Wild. One phase of human sleep is called REM (Rapid Eye Movement) sleep. This is the phase where we ‘blink’ our eyes often, and it’s the phase where our dreams are the most vivid (the dreams you actually remember are had during this sleep phase). Funny thing is that ant queens show a similar behaviour when they’re fast asleep. Instead of their eyes, they twitch their antennae, resulting in so called ‘Rapid Antennal Movement’ (RAM) sleep. This begs the question…what do ants dream about? This entry was posted in Ant science and tagged Fire ant, rapid antennal movement, sleep. Bookmark the permalink. 3 Responses to What do ants dream of? Pingback: เห็นมดขยันทำงานทั้งวันแบบนี้ มันก็หลับเป็นเหมือนกันนะ! | คุณรู้หรือไม่? sitee is working, no uestion very shortly it will be famous, due to its quality contents.